Do I need A/AS-level maths? BSc / MSci Social Policy with Quantitative Research Methods. Units marked with an asterisk (*) below are also available to other students. What these (+QRM) programmes have in common is that students spend one third of their time on the new cross-disciplinary quantitative research methods pathway in years one to three of their study (two thirds in year four for students taking an M.Sci. programme). The remaining content is the same as for the existing single honours programmes in geography, childhood studies, policy studies, politics or sociology. We have deliberately sought to minimise the differences between the new +QRM programmes and the existing single honours programmes in the disciplines concerned. The reason is that we want sociology students to be taught sociology, geographers to be taught geography, and so forth – we are looking to generate social science graduates with strengthened quantitative skills but not to replace disciplinary specific learning. To strengthen the training in and understanding of quantitative research methods for students in (human) geography, childhood studies, social policy, politics and in sociology. To do so in an cross-disciplinary setting, complementing and not diminishing the core subject-based knowledge and learning expected of students in their home disciplines. To equip students with the numeracy, applied statistical and data handling skills sought by employers, whilst also fostering appreciation of the importance and diversity of quantitative methods as tools for social research, critical enquiry and for policy debate. To support and to provide opportunity for students to demonstrate their proficiency with quantitative methods as part of a research dissertation in an area of quantitative social science relevant to their home discipline. To provide opportunity for students to undertake advanced quantitative methods training at a Masters level, providing a pathway towards doctoral research. Do I need A or AS-level maths? No. The entry requirements for the +QRM degree programmes are the same as for the existing single honours programmes in childhood studies, geography, politics, sociology and social policy. Although familiarity with higher level maths may be helpful, those without A or AS-level maths should not be put off from applying. Learning how to undertake quantitative data analysis is not the same as learning maths. What we are looking for is students who are willing to approach quantitative methods with a critical and enquiring mind, and a willingness to learn. The level of maths required and taught on the programmes should be accessible to a student with an A or B grade at GCSE maths. Segregation and inequality in the UK (measurement and debate)* (20 cps). *Also available to other students as open units. Convincing Stories: Quantitative methods are central to social and scientific research, to business and to industry, and knowledge of them is a transferable skill that is attractive in the jobs market. 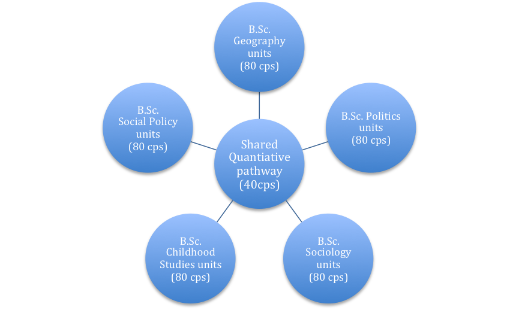 This innovative unit, sponsored by the British Academy, Economic and Social Research Council and the Higher Education Funding Council for England, offers an introduction to quantitative social science, looking at how numbers are used (and abused) to create "stories" in the media, public policy, and in social and scientific debate. The aim of the unit is to prepare students for the sorts of methods and techniques they will encounter in their own discipline by discussing and debating the ideas and concepts that are used to create evidence in an uncertain world, and upon which decisions are made. The unit will encourage students to engage critically with research and debate in their own subject areas, placing them in a better position to learn quantitative skills, to conduct their own research and to enhance their studies. This is not a class on statistics but a class about how and why numbers are used in society. Students who have little or no interest in quantitative methods, who are anxious about mathematics or who simply want to get a head start in their studies are especially welcome on the unit. Segregation and Inequality: The aim is to consider the extent to which the UK is a segregated or unequal society giving particular consideration to what is meant by segregation and inequality, how these concepts may be formalised and measured, how the measurement affects our impression of the severity or otherwise of social and ethnic divisions in the UK, and the way notions of poverty, inequality and 'the underclass' are used in political and social debate. The unit provides a student-friendly introduction to a key issue in social science: how do we take an idea, turn it into something measurable, and what are the consequences of doing so? Conducting a Research Project using secondary data* (20 cps). *Also available to some other students as optional units. The exceptions will be geography students who will not be required to take the first of these new units, instead continuing to take the existing unit Spatial Modelling 2 (20 cps, mandatory in the existing geography programmes for all students). Principles of Quantitative Social Science: Understanding how to use, present and analyse data, select the right statistical test, interpret the results correctly and to communicate findings honestly and effectively are essential tools in social science, policy research and also in business and commerce. The aim of this research is to introduce students to the principles of statistical enquiry drawing on examples from social scientific research. It will also provide an introduction to the statistical software, SPSS. Conducting a Research Project: The purpose of the unit is to prepare students to undertake a third-year dissertation using secondary data. It will focus on sources of secondary data, how to make sense of them, how to form a viable research question grounded in an appropriate academic research literature, and ways to answer the question quantitatively. It will address issues of research design, including sample size and the issue of statistical power, and also consider some of the underlying philosophical tenets of quantitative approaches, their strengths and weaknesses, how they compare with qualitative approaches, and when to decide when a quantitative or qualitative approach might be better. Practical classes will show how secondary data can be accessed and analysed in meaningful ways. Spatial Modelling 2: The unit explores focuses on the use of ArcGIS and of R to teach principles of scientific computing, principles of geographical information science, mapping data, using regression to explain what we see on a map, point pattern analysis and spatial regression analysis. A key aim of the unit is to provide quantitative research training suitable for dissertational work, developing skills in computing programming, geographical data handling, mapping and analysis, and in the presentation and interpretation of statistical information. Dissertation (with Quantitative Research Methods) (40 cps). In addition, the existing and popular geography unit, Spatial Modelling 3: Multilevel Modelling (20 cps) will be mandatory for geography +QRM students. Dissertation (with QRM): The dissertation provides an opportunity for students to undertake and report on a piece of original and individual disciplinary research on a topic of their own choosing but requiring the use of quantitative methods. It allows students to demonstrate their skills in topic selection, in investigating the background context of their chosen topic, in research design and implementation, in data analysis, interpretation and presentation, and in report writing. Spatial Modelling 3: This unit aims to provide students with a theoretical and practical understanding of a major strand in current quantitative social science: multilevel modelling. Populations commonly exhibit complex structure with many levels, so that individuals (at level 1) may learn their health-related behaviour in the context of households (2) and local cultures (3). By using multilevel models we can model simultaneously at several levels, gaining the potential for improved estimation, valid inference, and a better substantive understanding of the realities of social life. Students who wish to do so can (subject to the University’s usual progression rules) continue into a fourth year of study, graduating with a master's-level qualification on completion. The fourth year will offer the opportunity for more advanced quantitative methods training and will see the students taking units alongside those currently run for year one postgraduate students as part of the Advanced Quantitative Methods pathway of the South West doctoral training centre. Participants will also be required to complete an Advanced Quantitative Research project. We are aiming to allow current students to transfer on to the new +QRM degree programmes and therefore to benefit from the enhanced quantitative skills training wherever it is possible to do so. In most cases, eligibility will be restricted to students who have taken one or preferably both of the year one units, Convincing Stories? and Segregation and Inequality in the UK. If you would like to transfer or want to discuss your eligibility to do so, please contract the Head of Teaching or Director of Undergraduate Studies in your school.